Hi. My name is Amy Masser. I am the mother of two really great kids. I opened Baby Face Photography in 1997 when they were one and three. What was I thinking? Actually, I know exactly what I was thinking. 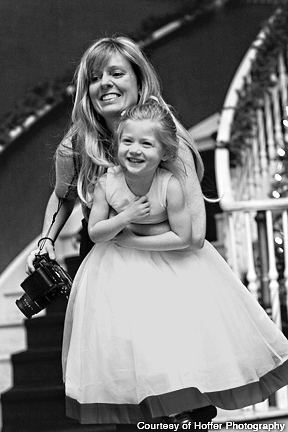 I couldn’t find a reasonably priced creative photographer in the area who specialized in children. So I started taking my own creative pictures. When my friends saw the pictures, they asked me to take some shots of their children. Pretty soon, strangers were calling for pictures. I took a few classes to learn the basics of studio photography and Baby Face Photography was born! I have filled my studio with child-sized props and wardrobe, many of which are original pieces I designed and created myself. BFP was designed to cater to young families. At BFP, it is understood that sometimes it takes a lot of patience to get the perfect shot.. I think what sets me apart from other photographers is my personality. You can see it in my children as well. We are a perfect mix of goofball and rockstar. My sister says I relate so well to children because I refuse to grow up myself. That coupled with my ability to appreciate the moment at hand. Just because the shoot isn’t going as planned, doesn’t mean I am not taking pictures. Sometimes a great pout can be the perfect shot. I love to read people and engage them. I try to open them up and bring them out. I do this even when I am not behind the lens. I love to get a reaction. I entertain myself by giving the perfect compliment to a complete stranger and watching their body language change. I am always looking for the most beautiful angle or expression on every face I see. Children are by far my favorite subjects. I think it’s their honesty that is so beautiful to me. A close second would be a parent holding their child. That is the picture of true love. I absolutely love my job. Thank you to all the parents who continue to bring their beautiful families for pictures. Watching your little ones grow has been a constant joy. Thank you for sending your friends for pictures and allowing me to continue to do what I love. See you soon. Brenda Quinn - Amy!! Omgosh, I have been trying to locate you for 3 years. Found your card in my office today..
We now have a 3 year-old gorgeous granddaughter with a very outgoing, fun personality.. She loves to be photographed and see the results. I am hoping you have some time to work with us between Christmas and her birthday (April 11th). I know you can capture this little girl like no one else could. So excited!! Thanks!! My grandson just turned 1 and I was looking to do a session with you. If we choose family portraits does that include pictures of just the baby too or is it too separate prices? Your portfolio contains such beautiful pictures. I’m looking towards end of the month if possible. Dania A. - I hope all is well. I was interested in your photography package for a maternity shoot and a newborn shoot. For the maternity photos, I was thinking end of June (if possible). As for the newborn, my due date is August 9th so not sure how timing will work.